Participants must be permanent, or casual St. Joseph’s employee’s or Glacier View Lodge employee’s on St. Joseph’s payroll over the age of 19. Each pay period, lotto participants names are provided to the Comox Valley Healthcare Foundation by St. Joseph’s Records & Benefits Payroll Deductions Report. Only participants whose names show a deduction will be eligible for the draw. Once the Comox Valley Healthcare Foundation has confirmed your eligibility, please keep a copy of this form for your records. Winners are required to pick-up their cheque in person at the Comox Valley Healthcare Foundation office, and must present their St. Joseph’s photo identification. Please note that a tax receipt will not be issued for the cumulative value of your bi-weekly payroll deductions. Completed application forms to be dropped off at the Comox Valley Healthcare Foundation office in front Lobby of Hospital or the payroll department. Payroll deductions will start the first available pay period after a completed application is received. A maximum of $20.00 can be deducted from any one employee per pay period for the Staff Payday Lotto. Termination from Lotto upon written request or termination of employment. Upon elective termination from the Lotto, there will be a 3 month waiting period before becoming eligible to rejoin the Payroll Lotto. Allows the Licensees to use, reproduce and/or publish in any related publicity, his/her name, photograph, image, likeness, biographical information, any statements made regarding a prize, place of residence, and/or voice for advertising and promotional purposes in perpetuity and in any manner and in any medium (including the Inter-net), without any compensation or further attribution or notification. Periodically we need to communicate with lotto participants for updates. Optionally, we can also email notification of winners (results are posted on our website and social media). 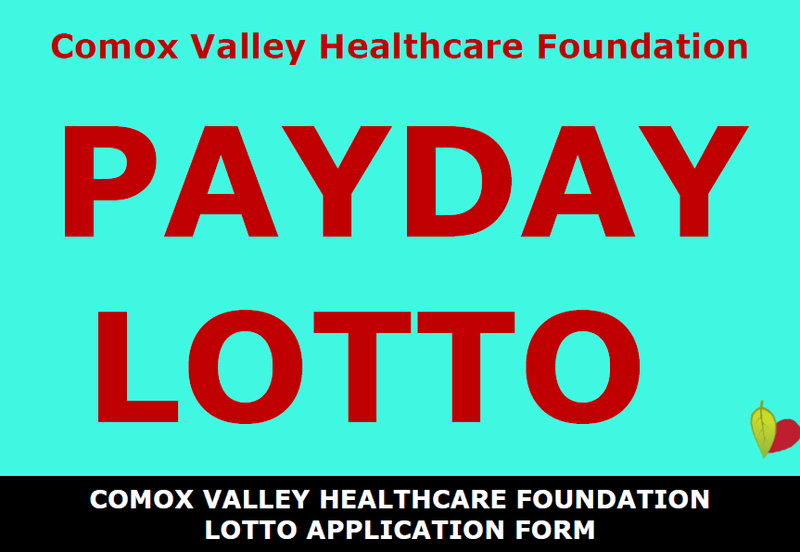 How did you hear about the Comox Valley Healthcare Foundation Payday lotto? I verify that I have read the rules of play and that my employee number and contact information is correct and current. I authorize payroll deductions as stated above to be deducted through St. Joseph’s Payroll department. Neither St. Joe’s or CVH Foundation are liable for entries not processed due to data error. Winner agrees to have their name and/or likeness published. Know your limit, play within it. Actual odds depend on the number of participants playing in each bi-weekly draw. BC Gaming License #114547.